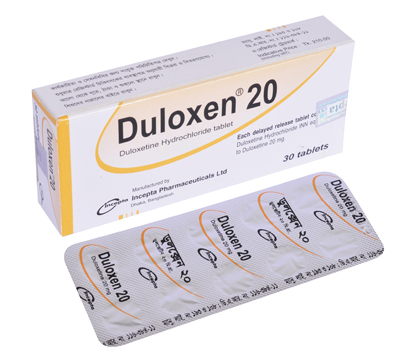 Duloxen 20: Each enteric coated delayed release tablet contains 22.45 mg of Duloxetine hydrochloride INN equivalent to 20 mg of Duloxetine. 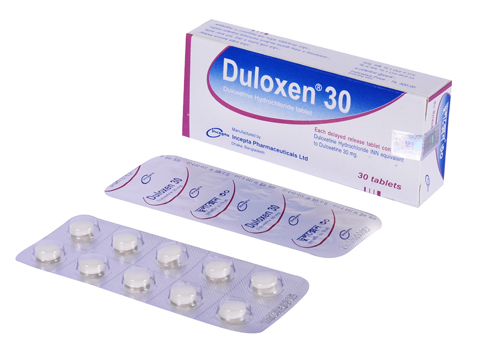 Duloxen 30: Each enteric coated delayed release tablet contains 33.68 mg of Duloxetine hydrochloride INN equivalent to 30 mg of Duloxetine. Duloxen (Duloxetine Hydrochloride) is a selective serotonin and norepinephrine reuptake inhibitor (SSNRI) for oral administration. Duloxetine is a less potent inhibitor of dopamine reuptake. Duloxetine has no significant affinity for dopaminergic, adrenergic, cholinergic, histaminergic, opioid, glutamate, and GABA receptors in vitro. Duloxetine does not inhibit monoamine oxidase (MAO). Orally administered Duloxetine hydrochloride is well absorbed. Elimination of Duloxetine is mainly through hepatic metabolism. 02. Management of neuropathic pain associated with diabetic peripheral neuropathy. • Urinary stress incontinence: Starting dose- 40 mg /day, Target dose- 80 mg/day (twice daily, max. dose- 80 mg/day (twice daily). The most commonly observed adverse events in Duloxetine hydrochloride treated patients were nausea, dizziness, dry mouth, constipation, decreased appetite, fatigue, somnolence, increased sweating, hyperhidrosis and asthenia. It may slightly increase blood pressure. No clinically significant differences were observed for QT, PR, and QRS intervals between Duloxetine -treated and placebo-treated patients. Duloxetine hydrochloride should ordinarily not be prescribed to patients with substantial alcohol use. Blood pressure should be measured prior to initiating treatment and periodically measured throughout treatment. It should be used cautiously in patients with a history of mania, seizure disorder and controlled narrow-angle glaucoma. Pregnancy: Pregnancy Category C. There are no adequate and well-controlled studies in pregnant women; therefore, Duloxetine should be used during pregnancy only if the potential benefit justifies the potential risk to the fetus. Labor and Delivery: The effect of Duloxetine on labor and delivery in humans is unknown. Duloxetine should be used during labor and delivery only if the potential benefit justifies the potential risk to the fetus. Lactation: It is unknown whether or not Duloxetine and/or it\'s metabolites are excreted into human milk, but nursing while on Duloxetine is not recommended.